Short but sweet. Juggling time and budgets can get in the way of longer vacations, but rest assured that Bozeman will deliver the goods, even if it is only for a couple of days. With so much to do and so little time, it helps to have suggestions! Here are a few favorites to make your way around our little bit of paradise. Get acquainted with downtown and add a little skip to your step by indulging in a fresh and healthy breakfast from the bustling Nova Café, voted the local favorite! Spend your morning ambling through miles of Bozeman's backcountry on horseback. The pine-scented air, gorgeous scenery, and the trail guides stories all aim to please. Reservations required, Find Local Horseback Riding Outfitters Here. If you have the time and the gusto, this combo is a great way to experience Bozeman's big backyard. The first half of the day is spent exploring the Yellowstone area's diverse terrain on horseback while the latter half is spent rafting down the wild Yellowstone River. The Yellowstone River is wide and scenic, with class II to class IV rapids. You will get the splashes and excitement you bargained for here! Splash down the Gallatin River, which is a smaller and deep mountain river. With challenging rapids for the enthusiast and calmer swells for the families and first-timers, the Gallatin has the best of both worlds. A local favorite for floating is the Madison River, known for its slow-paced stretches of water. Put in at Warm Springs turnout, float down the river for 3 hours or so, and take out at Blacksford. You won't need a guide for this one. 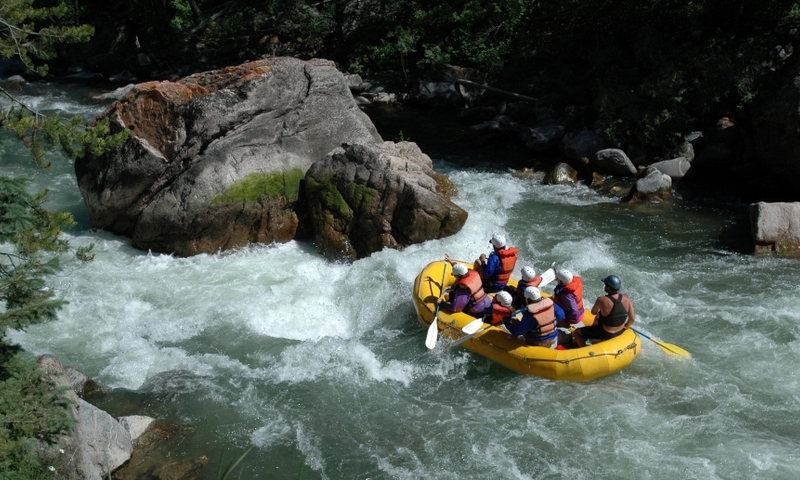 Find more information on our Guided Rafting Trips Here. Of all the restaurants in Bozeman, the Montana Ale Works comes in on top for many. Nestled right downtown, find yourself feeling welcomed immediately by the friendly staff. Dinners are consistently delicious as are the many locally brewed beers on tap. For a real treat, find your way to Plonk, Bozeman's posh wine bar and restaurant. Treat yourself to perfectly prepared delicacies while enjoying the hand's down finest martini's in town. For a quaint dining atmosphere, similar to something you would see in an episode of the Twilight Zone, you have to check out Soby's. Serving heaping plates of both Mexican and American dishes, the food, service, and atmosphere of this place will leave you feeling good. Paragliding - Strap yourself in to some gear and jump off of a mountain! Sound exciting? It is. Glide effortlessly down steep landscapes, dip into canyons, and take in incomparable Bozeman sights with a paragliding guide. Hiking - With our vast network of trails in and around Bozeman, it's hard to choose just one! One of our pride and joy's is Bozeman's “Main Street to the Mountains” trail, which begins at the Bozeman library on the East end of town. Depending on your fortitude, you can choose any of 50 miles of trail that winds its way through Bozeman parks all the way to the top of scenic ridgelines. The Museum of the Rockies – This museum is a fun way to pass the time, showcasing an extensive paleontology collection as well as a world-class planetarium. The Children's Discovery Center is a new favorite part of the Museum! Come check out the exhibits! Visit www.museumoftherockies.org for more information. Mountain Biking – Rent a bike from one of the local bike shops and cruise through Bozeman. Bike to Bozeman Beach and bike past Bridger Golf Course to get a great view of the Bridger Mountain Range. Hot Springs – Looking for a win-win situation? Drive 33 miles west of Bozeman and try out Norris Hot Springs. Every weekend there is live music playing right by the pool and refreshments nearby as well. Call (406) 685-3303 for details. Fly Fishing – Hire a guide and spend the afternoon fishing one of the pristine rivers surrounding Bozeman. The Gallatin, Jefferson, Madison, Yellowstone, and Missouri Rivers are easily accessible and considered the crème de la crème of fly fishing destinations. Golfing – We have two public golf courses in Bozeman; Cottonwood Hills and Bridger Creek. Nestled at the base of the Bridger Mountains, Bridger Golf Course offers that priceless picturesque scenery. Cottonwood, also beautiful, offers a 9 Hole Executive Par 3 course, which I especially enjoy. Call Cottonwood Hills at (406) 587-1118 and Bridger Creek at (406) 586-2333. Ted's Montana Grill is the original Ted Turner location for hearty Montana-style cuisine. The bison pot roast and weekend prime rib are hits, and the side dishes are all about comfort food. Set in the historic Baxter Hotel on Man Street, the atmosphere is unique and vibrant, with live music most nights. Warm up with a drink (How about a Moscow Mule in a copper mug?) at the Bacchus Pub - next door, in the same building. The outdoor seating, quaint atmosphere, and amazing rolls at Dave's Sushi always lures me back for another bite. Ask about the Gobbler (not on the menu)! If you haven't already, visit Yellowstone National Park. The scenery and wildlife is truly remarkable, with bears, wolves, and buffalo meandering through traffic regularly. Bring a suit and experience the hot and cold currents of the boiling river, one of my favorite parts of the park.